What does summer mean to you? Somewhere on the list that just silently popped into your head is probably HEAT. In addition to vacations and lazy days, summer also means a dramatic increase in water use. This is not only bad news for your bank account, but for local water supplies as well. From watering your lawn to filling the backyard pool, water usage tends to peak during summer months–especially in late July or early August. Fortunately for you, WaterSense is here to help. By offering a few tips and suggestions, WaterSense can help increase the efficiency of your water use and help you save both money and your local community’s water supply! Instead of washing only half a load of laundry, try waiting until a full load needs to be done. The same goes for the dishwasher–wait until it is entirely full before running it and try scraping food off your dishes instead of rinsing them. Water your plants and lawn only when absolutely needed and try and stick to hours early in the morning or evening. Most water use peaks between 6:00 a.m. and 9:00 a.m., followed by a secondary peak between 6:00 p.m. and 9:00 p.m. When reaching for a glass of ice water to cool down, try putting a pitcher of ice water in the fridge instead of running the tap and waiting for it to get cold. Add cucumber garnishes or a zesty fruit for an extra punch! Finally, fix those leaks around the house that you have been putting off! 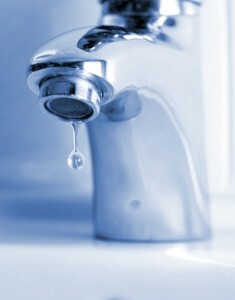 Unfixed water leaks can waste up to 200 gallons per week equaling both a huge waste of money and water. Cutting back on water use and investing in WaterSense approved products can help save more than 9.3 billion gallons of water. For more information about WaterSense and how you can lower your water usage, please visit their website. Equifax Personal Finance Blog. One of her picks is a programmable sprinkler timer, which allows you automate the timing of your watering with simple garden hoses – no need for expensive irrigation systems. With just a $50 investment, you can save money and be a good water steward at the same time! This entry was posted in Energy Efficient and tagged Water usage, WaterSense on June 4, 2010 by Carol Morgan.